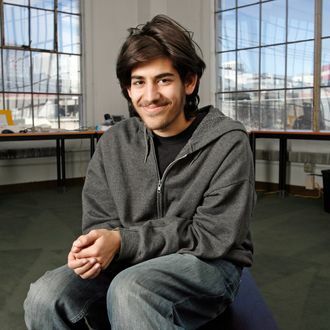 Last night, hundreds packed the Great Hall at Cooper Union to remember the too-short life of Aaron Swartz, the 26-year-old Internet activist and Reddit co-founder who hung himself in his Brooklyn apartment earlier this month. Friends and admirers spoke about how he “burned with a love for humanity,” was “marvelously and vigorously different,” and “was trying to hack the whole world, in the best way.” But it was folk singer and longtime activist Pete Seeger who, in a statement read out loud, captured the angry undertone of the event: “[It is] a tragedy for this brilliant young man to be so threatened that he hanged himself.” As for who’d so threatened Swartz, the audience knew them all too well. Others turned their anger on MIT, normally an outspoken advocate of open access. One Yale professor who spoke at the memorial remembered how Swartz “told me about the 4.5 million downloads of scholarly articles, and my first thought was why isn’t MIT celebrating this?” The university is now investigating its role in the Swartz case. At the end of the tribute, Stinebrickner-Kauffman lamented that Swartz would’ve hated such a public event in his honor, but “memorial services are for the living, and last Friday he forfeited his right to decide that.” She then read from Maya Angelou’s poem “When Great Trees Fall” — because Swartz apparently hated poetry as well.